Appreciating 2017, a look back over the last 12 months. This year the plan was to write a slightly more poignant end of year review than the more typical ‘here’s a list of everything I’ve done’ type thing. Whilst they of course serve a purpose, I don’t find they always have much meaning to them. Frustratingly I have run out of time to write such a post in full, as December was a lot busier than I had expected. Currently I’m sat in a hectic town in the Bangladesh countryside, listening the hustle, bustle, and beeping horns, of the traffic outside. I’ve been here almost two weeks and fly home in two days, but alas, we’ll be in 2018 by then. So yes, I have most definitely run out of time to write the piece I had wanted and this is, as a result, a little rushed! What I will say is whilst I love to take photos, it’s the varied nature of what I do that I find most interesting and this year was no exception. From talking at my local camera club, eight minutes up the road, to covering three continents in three days, travelling has been prominent. With 32 flights in total, and 26 being since August, my noise cancelling headphones have certainly earned their money in 2017! No matter how far the journey or the reason for being there, be it deep in the Portuguese countryside, holding a workshop to a room full of people who don’t entirely understand what I’m saying without a translator, to being diverted mid-flight due to an on-board bomb scare on my way home from Slovenia, to playing a part in the UK press launch of one of the best cameras to-date, the Nikon D850, none of it has gone by without appreciation that someone somewhere has liked something about the photos I have taken, to put me in those situations. Of course the other thing that would be most typical with a post such as this is to share some of my best shots for the year. However, again, doing such a thing isn’t without its challenges. You see us photographers are a funny bunch, we like people to see our best work but not before we’ve been able to achieve either some recognition or commercial gain from the very best stuff. So my dilemma becomes what to show. I’ve taken quite a few photos, some good, some bad and many deleted without even making it off the camera. I’m a very fussy photographer and don’t like to share everything I take, so I don’t always post as much as I should – as my Instagram account will attest. With that thought in mind I decided to pick a couple of images that remind me to appreciate something that has happened during the course of the year, so there’s at least some meaning behind each image, regardless of their technical, artistic or originality merits. The stag was taken with the Nikon D850, ahead of its world-wide release and whilst a simple silhouette, reminds me how fortunate I was to be given the camera early. This was one of the first times I shot with it and subsequently I also wrote the first full, real world, review of the camera, anywhere online, which resulted in an influx of traffic so large my website crashed, as I was about to board a flight. You can imagine the frantic emails to my hosting support that followed and how the flight attendants words ‘please enable flight mode now’ have never been so painfully unwelcome, signalling the longest 2 hour flight of my life! The lion at the top of this post is again a simple image but a reminder for me not to take the encounters I have for granted. 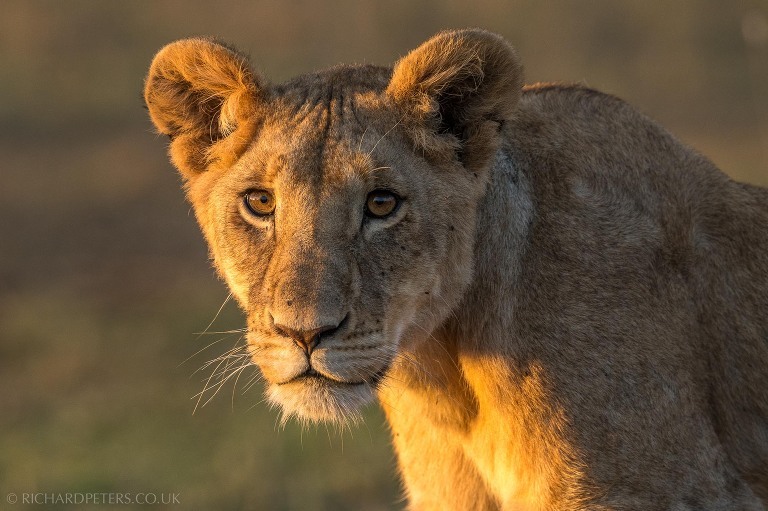 After spending several weeks in the Maasai Mara, co-guiding with David Lloyd for both our Big Cat and Migration Safaris, it can become all too easy to want to head towards something other than the same pride of lions I’ve seen many times before. But every encounter brings the opportunity for something new and if nothing else, it’s situations such as this, when the first rays of light beam their warmth onto a subject, that I am reminded just how lucky I am to be witness to that moment. Not everyone will see the things we see in our lifetime, so it’s so important none of us take for granted these experiences, no matter how many times we may have encountered them before. Skomer Island is one of my favourite locations to visit and so I simply had to include a shot from our Sensational Skomer trip there, which I lead alongside fellow wildlife photographer Drew Buckley. This year was our first official trip together and we were thrilled that it sold out through word of mouth before we could even advertise, something both of us were quite taken aback by! So a huge thank you to those who spent time with us on the island for those few days back in the summer. To finish, and as an example of my comments on delaying showing certain images, my photo Beautiful Chaos was recently awarded in the 2017 GDT European Wildlife Photographer of the Year. However it was actually taken a year and a half ago. I’ve shown it in a couple of talks but it’s never been officially shared publicly until recently. So instead of it making last years end of year cut, it makes it into this years. And there we have it, as the sun sets over Bangladesh and I begin to pack my suitcase for the start of tomorrow’s two day journey home, I’ll wrap the post up by saying whilst photography and travel are at the heart of my love for this job, it’s the people I meet that provide some of the most memorable of my experiences. Over the years I’ve made life long friends in a variety of countries and a multitude of backgrounds. 2017 has been no exception there so thank you as ever for continuing to support and follow my work. Whether you came on a photo trip, a one-to-one workshop, were one of the many people who contributed to crashing my website, read a magazine article I wrote, attended a talk either in the UK or abroad, or sent me a tweet. Each and every one of those actions is valued and appreciated. So here’s to 2018. If you’d like to keep up with what I’ve got going on during the course of the year, please do subscribe to my newsletter. For now. Wherever you are in the world, I wish you the very best for the year ahead.